The Martin Woldson Theater at The Fox on Sept. 10, 2017, part of this season's opening weekend of performances. Bill Simer remembers the goosebumps. After years helping raise money and rallying the Spokane community around the Spokane Symphony's effort to buy and restore the classic Fox Theater, reopening weekend had finally arrived. After a symphony show with opera star Frederica von Stade, and a "Community Day" to show off the newly reborn space, pop-jazz legend Tony Bennett was on stage Monday, Nov. 19, 2007. And he was letting Simer and the rest of the audience know how special the space — originally opened in 1931 — still was. "He was commenting how many communities didn't have the will to do what Spokane did," Simer recalls. "He said many communities just tear these places down. Then he said, 'Let me show you just how good the acoustics are in here.' He turned off his mic and he sang a cappella, without any amplification, and it gave you goosebumps. It was so amazing." Simer, now a CPA and partner at Eide Bailly Spokane, grew up going to movies at the Fox. It was a "dark and dreary place," he says, but still special. Years later, he was on the symphony board when the orchestra was performing in the Spokane Opera House, finding its schedule squeezed by an increasing number of touring Broadway shows coming to town. The symphony board got wind that the Spokane Club was negotiating to buy the building from Regal Cinemas, with thoughts of turning it into a parking lot. After some public outreach and negotiations with the Spokane Club, the symphony gained the rights to buy the place. "The only problem was," Simer says, "we didn't have any money!" Grants, donations and loans together made the restoration of the Fox Theater a reality, a massive effort that eventually made the Spokane Symphony owners of the Art Deco space that in its early years hosted live performances by the likes of Katharine Hepburn, Frank Sinatra and (of course) Bing Crosby in addition to decades of movies. 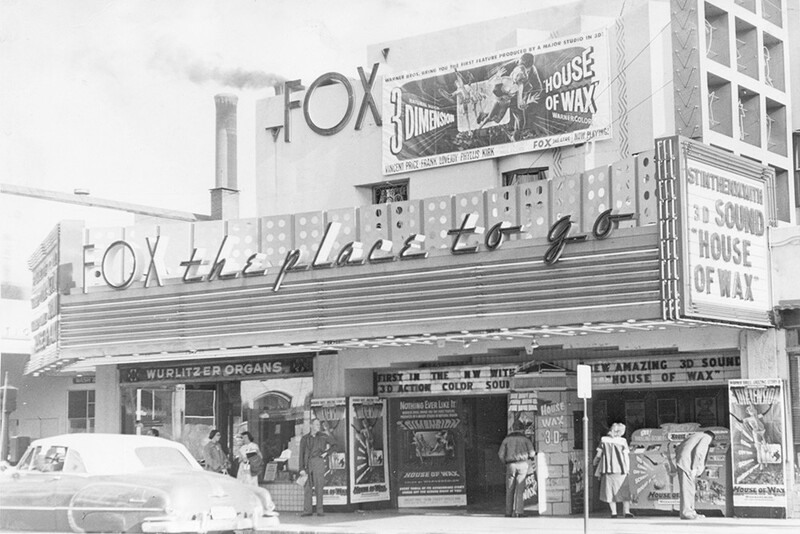 This fall the Fox celebrates 10 years since its restoration was completed, with November designated "Celebrate The Fox" month, giving Spokane an opportunity to reacquaint itself with a community gem that was nearly lost forever. "When you think about a $31 million project, it was a big lift for this community," says Simer, one of the co-chairs of this fall's 10th Anniversary Gala. "It's interesting, when the theater was first finished between 1929 and 1931, the country was in a real financial malaise with the Depression. And when we finished it in 2007, the country was again in financial doldrums and that made it more difficult. It was a lot harder to raise money, and frankly, it was a lot harder to run a theater because people weren't spending money on concerts and going out as often. So it presented challenges not unlike the challenges the theater had when it was first opened." Joan Degerstrom remembers the windows. When the Fox Theater first opened on Sept. 3, 1931, downtown Spokane was packed with people celebrating the city's Golden Jubilee, a party that included the debut of what was Spokane's first air-conditioned building. "I was there at the opening and they had people standing in the intersection there," the 93-year-old Degerstrom recalls. "I was about 8, and I was excited to see a new theater like that. My folks and my little brother were with me." Degerstrom's family couldn't go in, but they stared through the large windows with thousands of fellow Spokanites, agog at the pageantry. She spent much of her childhood walking to the Fox from her house on 17th Avenue: "In those days kids could walk downtown safely, and [movies] cost a dime." She remembers that the seats along the right aisle had earphones for people hard of hearing like her grandmother, "and they didn't play the movies so loud as they do now." Degerstrom was a fan of everything from the pulpy double features they'd show most weekends — "they'd show, like, an A movie and a B movie, and then they had newsreels because there wasn't TV or anything" — to special events like Around The World In 80 Days, "big movies that were sort of special." An avid Shirley Temple fan, Degerstrom remembers that "one time, on her birthday on April 23, they had a great big huge cake and showed a couple of her movies." 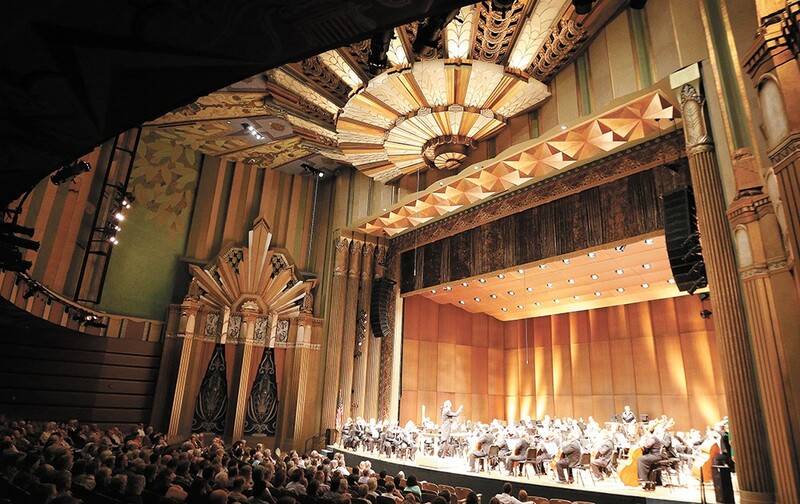 Since the restoration, Degerstrom has been a Spokane Symphony season-ticket holder, and the Fox Theater she now enjoys is remarkably similar to the one she first saw more than 85 years ago. The original Fox cost $1 million. Its Art Deco design came from architect Robert Reamer, the man who designed Yellowstone National Park's stunning Old Faithful Inn as well as Seattle's 5th Avenue Theater. The murals covering the lobby walls were done by artist Anthony Heinsbergen in an "Under the Sea" theme that becomes clear as one climbs the stairs from the "underwater" lobby to the "sea level" mezzanine and the scenes change from water plants to castles and clouds. Inside the theater, the ceiling evokes a night outside, with nine light fixtures representing the nine planets (yes, Pluto still counted in 1931) as well as forest scenes and "stars" dotting the ceiling. At some point, all the colorful blues, greens and pinks of the original theater were covered in a layer of red, as it became a multiplex with its balcony divided into two small screening rooms. The restoration not only peeled the red paint off — as well as years of accumulated popcorn grease and cigarette smoke — but gave the original murals new life with a refurbishing by the original artist's own son. The capacity was reduced from about 2,300 seats to 1,600 so a sound booth and lounge area could be added. Degerstrom sees a few details in the restoration that only someone like her, here from the beginning, might recall. The restrooms upstairs had filmy curtains that she misses, and she wishes that they'd taken out a couple more rows of seats during the restoration: "I don't even know how tall guys can sit there!" "It's too bad they never took any color pictures of the theater" back in the early years, Degerstrom says. "They're all black-and-white. I remember when I first went in when they renovated it, the blue carpet. I thought, 'That's wrong.' It was never blue! The pattern, it's the exact pattern, but it was not blue. Otherwise, they did a fantastic job." Eckart Preu remembers the first sound check. The Spokane Symphony's conductor and music director, starting his 14th season, had taken over as the restoration campaign was underway, but had to wait a few years to take the symphony's 70 musicians inside their new home. "Before we played the first concert or first rehearsal, we had these sound checks with just the orchestra, and then just the orchestra and the chorus, just to see what the kinks were and how it would sound. Just that experience of intimacy that we all had there together, it was incredible." Preu credits the Fox with making the Spokane Symphony grow artistically in ways that would have been impossible elsewhere. Every building is different, new or old, and the musicians have to rise to the challenge no matter where they play. With the Fox, Preu says, "we just got so lucky." "You're only as good as your instrument," he says. "As the musicians are depending on the quality of their individual instruments, the orchestra is dependent on the hall that we're playing in. "What this hall does for us, it asks us to play more variety of colors, more extreme dynamics and difficult articulations. It allows us to do all these things we couldn't do before. It kind of redefined the way we play together, how we approach a score, how we learn it, how we play it. It's really a whole different ballgame." The improvement for the musicians equates to an improvement for the audiences, who now get to hear the power of the symphony from all points in the room. To Preu, the restoration of the Fox and the symphony finding a permanent home is more significant than simply the saving of an architectural treasure and concert hall. • Nov. 3, 10th Anniversary Gala with special guest Thomas Hampson, a Champagne reception, dinner, a poem written for the theater by Washington Poet Laureate Tod Marshall, dancing. • Nov. 4-5, Overtures and Arias with Thomas Hampson. The Spokane native and Grammy-winning baritone gave the final performance at the old Fox before it went dark for the restoration, and was a vocal supporter of the project. • Nov. 11, The Mambo Kings present Afro-Cuban rhythms and jazz improv. • Nov. 12, Tours of the Fox from 1-3 pm. Lobby and theater open and free to the public. A $5 history/architecture/art and behind-the-scenes tour is also available. • Nov. 30, The Nutcracker opens its annual run, as more than 75 local dancers join the Santa Barbara, California-based State Street Ballet and the Spokane Symphony for the holiday favorite. Visit spokanesymphony.org for more information.